A quite different narrative emerges from a separate study of technology and social media. An analysis of the most linked-to technology stories in blog and Twitter posts finds that users of social media portray a stronger sense of excitement than the mainstream press about the latest technological advancements. The concerns in social media are also different from those in the so-called MSM as well. Rather than anxiety over the potential dangers associated with new developments, users of social media worry about obstacles that stand in the way of technological progress. China’s reluctance to allow a free and open internet, for example, produced more discussion in the social media studied than cyber-related crimes or the pitfalls of texting while driving. In fact, texting while driving was not among the top stories on blogs or Twitter throughout the entire time period studied. To users of the social networking site Twitter, technology is an enormously popular topic of conversation. More than half (51%) of the top five stories in a given week on Twitter were about a technology-related topic. That was much larger than the less than 2% of the newshole that the mainstream press devoted to similar subjects. And the technology areas that Twitterers focused on demonstrated that feeling of enthusiasm over advancements, coupled with disdain for things that prohibit their use. 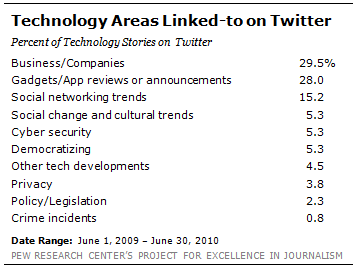 More than any other subject, Twitterers posted news from the business side of technology. Almost a third (30%) of the top stories focused on companies or the business aspects of the industries, versus just 9% in the mainstream press. Some of these business stories shared news of positive new developments, such as the February 2010 reports that Yahoo purchased the Twitter firehose (and industry term for the full feed of all Tweets posted to Twitter, in real time), which would allow the company to add real-time tweets to search results. Others demonstrated concerns about companies or decisions that might slow down technological progress. For instance, in November 2009, news that Microsoft was banning as many as a million users of their XBOX Live gaming service for modifying game consoles or using illegally downloaded games was a significant topic of discussion. The next two most popular areas for users of Twitter – gadget reviews and trends in social networking—highlighted the positive. New product announcements frequently triggered a flurry of activity within this tech-hungry crowd. The week of October 5-9, 2009, for example, news of a Flash programming application for the mobile iPhone device quickly became the most linked-to story on Twitter. On the social networking side, a report that the majority of social network users are women ranked among the lead stories the week of October 5-9, 2009. But so did a trend Twitterers found more disruptive to technology: research indicating that more than half of U.S. workplaces block networking sites. And in May 2010, news of a bug within Twitter that could force users to follow other Twitterers without permission led the discussion with 22% of the week’s links. The problem areas of technology, which generated significant concern among those in the mainstream press, were n ot nearly as important to those on social media. Crime incidents, for example, made up only 1% of the stories on Twitter, while cyber-security (5%) and privacy (4%) also received scarce attention. These same areas of interest were also evident when considering the specific storylines covered on Twitter. 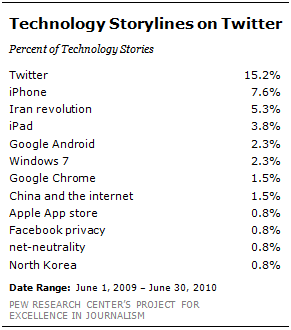 The top storyline, with 15% of the stories, was Twitter itself. Whether it was an outage of the site, the posting of the five billionth tweet, or an article about the connection between the site and real-time journalism, whenever a Twitter-related subject made news, it rose near the top of the social media agenda. Developments with Apple’s iPhone, one of the most popular portable devices in 2010, were second at 8%. Users of Twitter, and of social media in general, expressed concern about the crackdown on information and saw the Web as the best way to bring awareness to the conflict. To many online, disseminating information about the protests or showing one’s solidarity by using the color green were acts of political engagement. In the blogosphere, technology-related topics were not as pervasive as they were on Twitter. 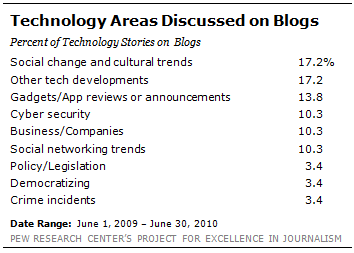 During the 13 months studied, 11% of the top stories on blogs were technology-related. While still much larger than the less than 2% of newshole about similar topics in the mainstream press, it was much less than the 51% of stories on Twitter. Still, the sense of strong optimism in the potential of technology rang strong. Popular stories about social change and cultural trends (17%) mostly highlighted the positive. The week of March 8-12, 2010, for example, the most linked-to story in the blogosphere was a BBC survey of more than 27,000 adults worldwide in which four-out-of-five people said they considered internet access a "fundamental right." Bloggers also paid attention to unique developments in technology (17%). These subjects included stories such as a Fox News report in July 2009 that described robots being designed by the Pentagon that would be powered by eating biomass and a March 2010 story about the Large Hadron Collider-the large particle accelerator that scientists hope would help discover the origins of matter but had to close at the end of 2011. Of less interest to bloggers than Twitter uses were technical developments such as gadgets (14%) and company news (10%).